Today WD is unveiling a slick 2.5″ hard drive it calls the WD Black Squared Dual Drive. Unlike previous 2.5″ drives which featured either a spinning hard drive or an SSD, or the two combined in a caching setup aka “hybrid drive,” this new model features two separate volumes that coexist peacefully in one chassis. It’s designed to be a high-performance drive for those with single-bay devices, such as a notebook, SFF rig, or AIO. If you fall into this category, and can squeeze your OS onto a 120GB volume, Christmas has indeed come early. The SSD is a 120GB model that features midrange specs and uses an unknown controller. WD does specify that it uses 20nm MLC NAND flash though, but it does not specify which company makes the flash. The HDD portion is a 1TB 5,400rpm hard drive, and WD told us that despite having similar specs as one of its midrange Blue models, this particular drive is a super-slim new model that is being placed in its Black category of high-performance drives. The drive’s chassis is 9.5mm tall, so although it will fit into most notebooks it will not fit into an ultrabook. Its price is set at $300. WD claims the drive is exactly what upgraders, DIY folks, and enthusiasts have been asking for, and we have to agree. Notebook jockeys craving performance have had to settle for either an SSD for their OS and a slow external drive, or go with a hybrid internal drive that isn’t quite as fast as an SSD for their OS. Plus, hybrid drive owners don’t get to choose what is cached and what isn’t, so this dual-drive solution theoretically solves that dilemma. 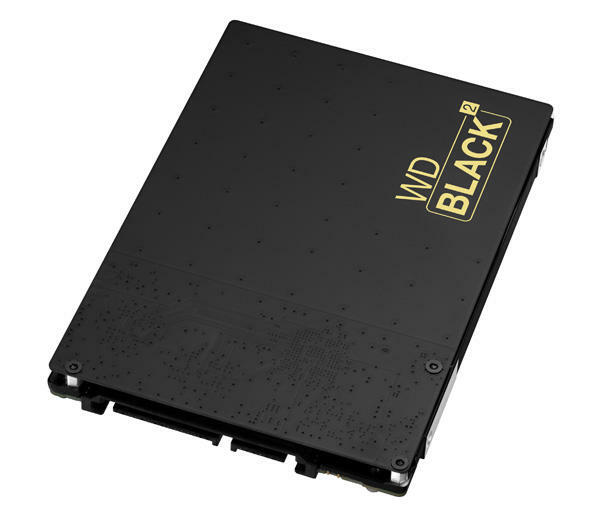 The WD Black Squared features a SATA 6Gb/s interface that both drives share. When you first connect the drive only the 120GB SSD portion is visible to the OS, and to “unlock” the terabyte (931GB after formatting) you’ll need to insert a USB key that comes in the package and run the software that is included. The USB key is mounted to a piece of paper that looks like a large key, and can be discarded after use. From there you have two volumes visible to the OS – the 111GB SSD, and the 931GB HDD, and you can choose whatever you want to put on each drive. WD keeps the 1TB hidden for two reasons. First, it recommends users perform a clean install of the OS on the drive, so hiding the other volume simplifies this process. Second, software is required to delineate the two partitions according to WD. There are a few limitations to the Dual Drive that should be pointed out. First, drive images cannot be spanned across both the SSD and HDD, so if you want to move your 250GB OS install onto the drive you are SOL. WD recommends reinstalling your OS, then copying your existing data to the new drive, and includes a handy USB-to-SATA connector in the box to help you accomplish this. WD also does NOT support the Mac OS this time around, so the software used to unlock the 1TB drive is for Windows only. You also cannot use RAID to stripe or mirror the volumes of this drive with other volumes, and any recovery partitions that came with your PC will not be able to be cloned to the drive, as the OEMs take measures to prevent this. For those who don’t want to do a clean install of their OS, WD provides a copy of Acronis True Image that you must download, but it’s included in the purchase. The drive also comes with an excellent five year warranty. So, how’s she run? WD’s specs claim the SSD can throw down 350MB/s read speeds, and 140MB/s write speeds. We ran a quick test on the drive and verified these numbers. It does not provide performance numbers for the hard drive however, as it’s a 5,400rpm model so what do you expect? Greased lightning? Its primary purpose in life is to store data, and conserve energy, though it is a single-platter 1TB drive, so performance should be more than adequate. 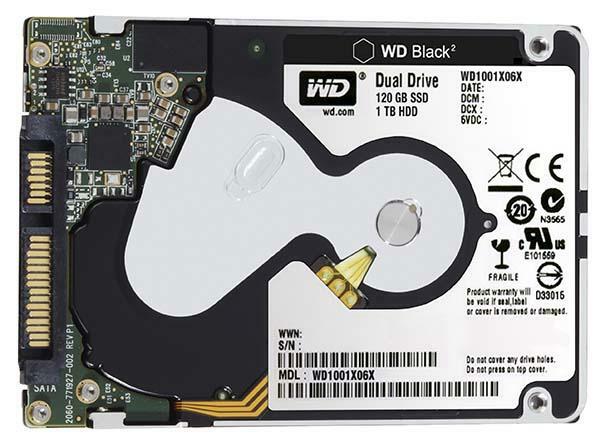 The WD Black Squared Dual Drive should be available for purchase from WD and online e-tailers. Look for a full review in an upcoming issue of Maximum PC. Original Post by Josh Norem, Reposted Courtesy of Maximum PC – Covering everything from hi-end gaming PCs to tablets, peripherals and home theater rigs, Maximum PC’s print and Web editions stay one step ahead of the fast-changing world of everything computer and computing related. Whether its the latest on building your own desktop system, reviews of the latest laptops and accessories, or roundups of the games and software that make your machine go, Maximum PC brings it to you with news, reviews, and years of expertise. TechnoBuffalo is thrilled to bring you the best of Maximum PC right here on our own pages to keep you immersed in all things digital.